Despite both Carles Cuadrat and Sergio Lobera debunking the favourites theory ahead of the massive final at the Mumbai Football Arena, the Blues would definitely have an edge as far as the psyche on close games matter. The recently concluded ISL league stages saw BFC coming up with numerous winners in the last ten minutes of the game, and whether it is Cuadrat’s dressing room pep talk or the brimming morale of BFC, but the Blues have always shown nerves of steel in pressure situations. Quite interestingly, both the sides have reached the final of the tournament once before losing to familiar foe Chennaiyin City FC and would be well aware of what is at stake for them. Goa, however, would have a bigger incentive in their hands after they went on to lose both their league fixtures against Bengaluru FC and would desperately want to prove themselves. With both the games seeing as many as three red cards, Sunday evening promises to be an enticing one with both the managers making contingency plans over other things. Another huge assumption that was put to rest in the pre-match press conference was that both Goa and Bengaluru FC have a similar style of play. It is really hard to make out the subtle differences amidst the similar weapons used by both the side. Both Bengaluru and Goa try to exploit the flanks as much as possible. While Cuadrat has Chhetri and Nishu Kumar running up and down relentlessly from the left, Udanta Singh and Rino Anto/ Rahul Bheke do the same from the right. As far as Goa are concerned, Mandar Rao Desai and Brandon Fernandes use a similar style on the left side of Goa's offensive structure, while Jackichand Singh and Seriton Fernandes take care of the other flank. The similarities don’t end there though. Both Bengaluru and Goa have their lynchpin in Dimas Delgado and Ahmed Jahouh respectively, who have the deep playmaking role alongside a partner to protect them. However, where Lobera differs is his preference of keeping the ball more, sticking to Pep Guardiola’s philosophy of the more possession one has of the ball, the fewer chances he has of conceding. Bengaluru, on the other hand, have a smash and grab style relying more on the speed of Udanta and the incredible individuality that Miku brings to the table. While Bengaluru’s trial and error have triumphed more times against Lobera’s organized football, the final night can see that changing. A huge disadvantage for Bengaluru could be Miku needing more number of chances to get the ball at the back of the net. His misses from three and five yards out had almost cost BFC the second leg against NorthEast United FC, who if not for their repetitive injuries, could have seen off the playoffs. Goa don’t have any such concerns with a prolific Ferran Corominas in their side for the Spaniard hardly misses from inside the box. 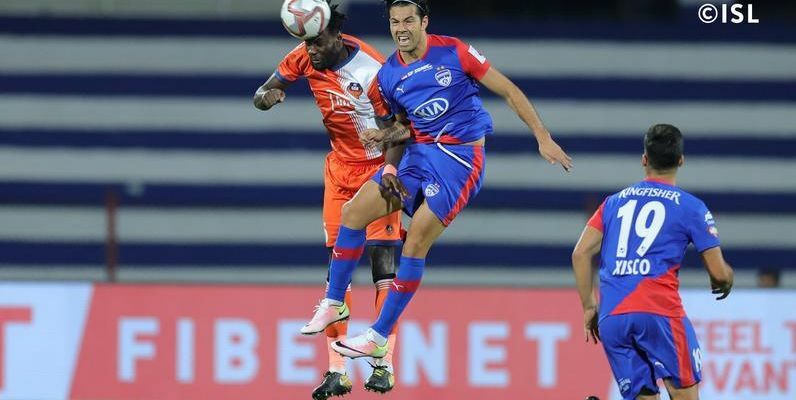 Goa’s Achilles Heel against Bengaluru FC could be the set-pieces. Even though the giant that is Erik Paartalu is out for the season for the Blues, the likes of Albert Serran and Juanan have been quite physically dominating over others. Goa, for their fluid transitional play, hardly have rigid blockades who could outmuscle opponents in the air. Although Mourtada Fall did a great job in stopping Moudou Sougou and Arnold Issoko in the playoffs against Mumbai City, he would have to shoulder too many responsibilities when it comes to corners and freekicks. Goa’s edge over BFC would be their ability to create chances at will. While BFC would mostly take refuge in Gurpreet Singh Sandhu’s long kicks at Miku or Chhetri and Udanta’s flank play, the Gaurs have a variety of arsenal in Edu Bedia, Hugo Boumous, Zaid Krouch and more, who could create chances out of thin air. However, all the technicalities go out of the window on a crunch night like today and as has been the case on many previous occasions, ISL finals have always thrown up a surprising winner as Bengaluru and Goa fans would love to tell you.